Steel is recycled more than all other materials combined. More steel is recycled annually than paper, plastic, aluminum, and glass combined. This is because steel scrap is an essential raw material in making new steel. With Earth Day this past Tuesday, we thought we should look at what allows steel to be recycled over and over and over again, with no change in performance. There are tons of sources for steel scrap all around you. From tin cans in your cupboard to old bikes in the garage, the broken toaster in your kitchen, just about anything can be recycled. According to bordersteelandrecycling.com, by recycling steel, you are doing your part to reduce the need for new mined minerals. In fact, two of every three tons of new steel comes from steel scrap. 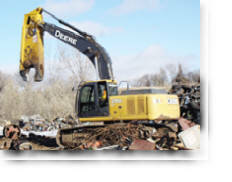 The only reason the ratio for scrap isn’t higher is because there are many uses for steel that have extended life cycles like bridges, cars and rail road tracks. 1. Millions of tons of iron and steel are diverted from the waste stream to the recycling stream due to steel’s magnetic properties that make it the easiest material to separate from the solid waste stream. 2. Almost 69 percent of all steel is recycled in North America each year – more than paper, aluminum, plastic & glass combined. North America’s average recycling rate has been in excess of 60 percent since 1970. 3. More than 80 million tons of steel are recycled each year in North America. 4. For every ton of steel recycled, 2,500 pounds of iron ore, 1,400 pounds of coal and 120 pounds of limestone are conserved. 5. Steel products can be recycled repeatedly without loss of strength. 6. Recycling steel saves the equivalent energy to power about 18 million households for a year. 7. When you buy ste el, you’re always buying recycled.8. More than 95 percent of the water used for making steel in North America is now recycled. 9. Since the first Earth Day in 1970, the steel companies in North America have invested more than $7.5 billion in capital equipment for the control of water and air pollution and the treatment of solid waste. 10. Since World War II, the North American steel industry has reduced its energy intensity by 60 percent. This conservation of energy has also contributed to a significant reduction in the generation of carbon dioxide. 11. The North American steel industry has achieved a 90 percent reduction in the discharge of air and water emissions versus 10 years ago. 12. The amount of energy needed to produce a ton of steel has been reduced by 34 percent since 1972. 13. $10 billion has been invested to create a New Steel that is better for the environment. 14. Steel parts are more dent-resistant and are up to 30 percent stronger than they were a decade ago. 15. More than 14 million cars in North America were recycled in 2006. 16. In 2006, the steel industry recycled enough steel from old cars to produce nearly 13.5 million new ones. 17. The first steel-made automobile was introduced in 1918. 18. A steel beam is placed inside car doors to better protect passengers in side-impact collisions. 19. Steel door latches help keep your car’s doors closed during a crash. 20. Your car’s safety buckles (seat belts) are made with steel. 21. A car’s structure, the safety cage, is made from steel. 22. An ULSAB Advanced Vehicle Concept is light yet safe, and it means better gas mileage and savings at the pump. 23. Over half of all the types of steels present in today’s automobiles did not even exist 10 years ago. 24. One scrapped car produces more than four steel utility poles. 25. 95 percent of the steel taken from commercial construction demolition sites was recycled and made into new steel products in 2002. 26. 100 percent of your steel roof can be recycled. Asphalt roofs – zero percent. 27. It takes more than 40 trees to build a wood-framed home. A steel-framed home—eight recycled cars. 28. Steel framing contains more than 28 percent recycled steel and is completely recyclable. 29. Steel roofs provide your family with excellent protection against wind, water, snow, ice and fire and are even hail-resistant. 30. Asphalt roofs actually weigh twice as much as steel roofs. 31. Steel roofs can last over 50 years, while traditional roofs last only 17 years. 32. Steel doors are fireproof. 33. Steel doors can provide up to 10 times more protection against intruders than wood doors. 34. Steel-framed homes won’t crack, warp, twist, rot, split or settle. 35. Steel-framed homes are impervious to termites. 36. 83,000 tons of steel was needed for the Golden Gate Bridge. Only half of that would be needed now. 37. Steel was first used for skyscrapers in 1883. 38. The New Steel makes it possible to build a high-rise building with at least 3 percent less steel than 20 years ago. 39. Steel food cans are the most recycled food package. 40. 24,000 community recycling programs in North America collect steel cans. 41. Canned food is as nutritious as its fresh and frozen counterparts upon preparation. 42. Canned goods do not contain preservatives. 43. Canned foods are the most tamper-resistant food packaging option available today. 44. 600 steel cans or tin cans are recycled every second. 45. More than 1,500 food items come in steel cans. 46. 90 percent of retired appliances are driven to recycling centers in North America by steel. 47. All 99 pounds of steel in the average major appliance can be recycled to make new steel products. 48. Appliance motors are made from steel. 49. Steel hinges on refrigerators can support more than 140 pounds of door weight without sagging. 50. Steel comprises approximately 75 percent of all major appliances.